Home / Blog / ​What Causes Bed Sheets or Linens to Pill? ​What Causes Bed Sheets or Linens to Pill? What is Pilling and what cause it? Pills are those unsightly little fuzzy balls you find in some fabrics, sweaters and occasionally in bed sheets. Pills can make a sheet rough and scratchy next to your skin. Bed sheets pill for several reasons. Cotton is sorted and graded based on many characteristics. One of the characteristics of lower grade cotton which contributes to pilling, is short fiber length. The finest grade of cotton is called Extra Long Staple (ELS), it is typically twice as long as Short Staple cotton. Extra Long Staple cotton fibers measure 1.5” or longer, while Short Staple cotton length is .8” or shorter. As you can imagine, the cost of Short Staple cotton is much less than the finer grades. This is why sheets made from substandard cotton are sold for under $100. Short fibers used in low quality sheets result in twice as many fiber ends in the spun yarn. Due to short fiber length, the yarn is not as strong as yarns made from longer fibers. Additionally, the yarn may not be able to be twisted as tight as yarns made from longer fibers. When the yarn has a loose twist, there are often loose or stray fibers, as shown below. These stray fibers end up knotting up and become pills. Wash in hot water or drying on high heat may damage and scorch the cotton fibers. 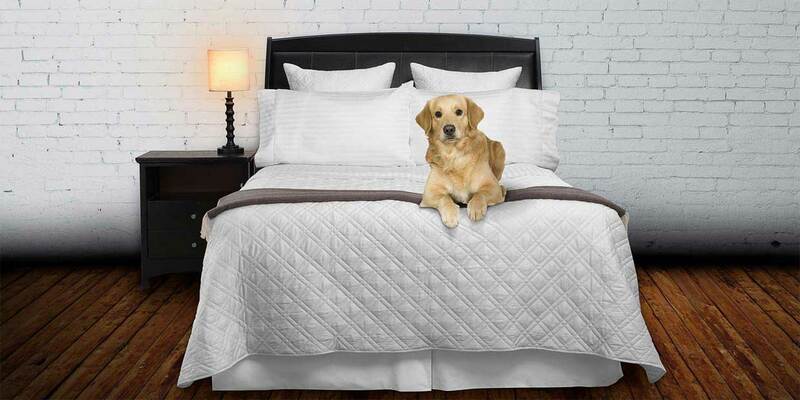 Wash your bed linens in cold to medium temperature water and dry them at a low or medium setting. Don’t over dry bed sheets and don’t leave the bed sheets in the drier after the drying cycle is complete as your just exposing them to unnecessary heat. Pull them out when they are slightly damp, then hand press/fold them. When left in the bottom of the drier they will also wrinkle more. Bleach and many caustic chemicals found in harsh detergents can damage your linen. Bleach can make the cotton fiber brittle and extended use of bleach can make your sheets yellow. Detergents such as Tide and Cheer contain brighteners – brighteners are bleach derivatives. Consider a mild detergent such as Dreft or Ivory, better yet, use Le Blanc linen wash. Which is specifically formulated for use on cotton – we sell it here. Yes, stubble from legs, back and faces (that haven’t been shaved in a few days) are effectively a Brillo pad, causing abrasion to your bed sheets with every toss and turn. We hope this explains why pilling happens. To see our video & blog post on the best way to clean your linens click here.